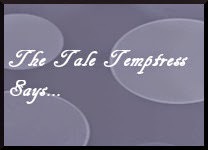 The Tale Temptress: Discussion Post: What do you do when you finish an amazing book and your family could care less? Discussion Post: What do you do when you finish an amazing book and your family could care less? My Discussion Topic This Week - What do you do when you finish an amazing book and your family could care less? Let's me explain what I mean by that first. So the other night, I finished this book that had me in tears at the end. It was a roller coaster of a book. It had absolutely everything that I love in a book. There was humor, suspense, a poignant heartbreak, people overcoming obstacles, a hot romance, etc... It was just 100,000 types of awesome. I finished the book, turned to my husband and said "pause the tv, you have to hear about this book I just finished." I launched into a detailed description of how amazing this book was and at the end he says, "sounds cool." I just stared for a good minute, then un-muted the tv. When I read an awesome book, I want to gush over it, and I want someone else to gush with me. So I get to gush over these books when I write my reviews, but I'm still left with the "no one's gushing back" part. I want to discuss every detail, see what another person thinks, hear their thoughts and see if they interpreted it the way I did. Are you like me? How do you do it then?